Trafimet S45 full torch. This torch is suitable for use as a direct replacement for a damaged S45 torch or as an upgrade for your machine to replace an unsatisfactory torch. 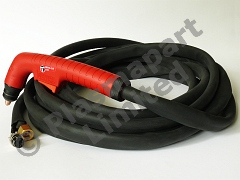 This torch is of very high quality and comes complete with one set of consumables and the maintenance tool pictured. It is fitted with 4m cables. This is a mechanical pilot arc torch and is not suitable for use with HF start machines. These can be supplied with a euro connection, or 1/4 bsp fitting, other fitments are available to order, please contact us.